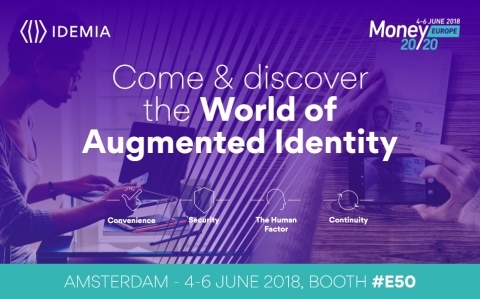 COLOMBES, France--(BUSINESS WIRE)--IDEMIA, the global leader in Augmented Identity, today announces its presence at Money 20/20 Europe 2018, regional largest exhibition covering the world of Payments and Fintech. It will take place in Amsterdam from June 4th to June 6th, 2018. IDEMIA stands for Augmented Identity in a connected world in which the security of identity has become essential, especially when it comes to financial transactions. IDEMIA guarantees secure, authenticated and verifiable transactions for clients from Financial, Telecom, Identity, Public Security and IoT sectors. Contactless Biometric data capture and matching with a single hand movement (Morpho wave)... and much more to discover. "Breaking the compromise between security & convenience"